The fact that of all the water on the Earth, just and only 3% is fresh water and the rest is seawater. In order to solve water shortage prevailing throughout the world, sea water desalination can be the only left solution for this global issue. 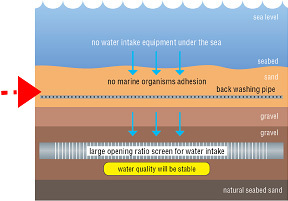 The reality is that RO (reverse- osmosis), the dominant technology, can process at a rate of only 50% (at a maximum) of the whole amount of sea water intake. The larger the scale of the desalination plants become, the higher the initial cost goes up. 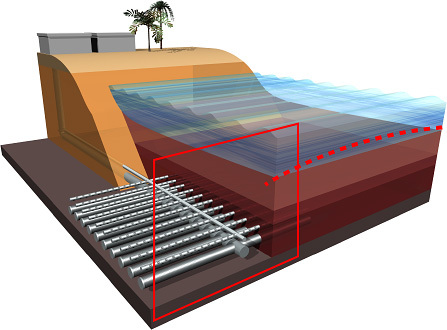 NAGAOKA has developed High-speed Seabed Infiltration System “HiSiS” jointly with Hitachi-Zosen, which is an innovative desalination technology with the application of NAGAOKA infiltration screen, reducing significant cost. Partnership with Beijing Enterprises Group Ltd.